These are great Pocket Knives! They beat hundreds of other manufacturers hands down! Spyderco pocket knives are superior. When you hold a Spyderco pocket knife in your hand you know you are holding quality. Lifetime Guarantee! This is a Spyderco "Delica" pocket knife with a smooth blade. 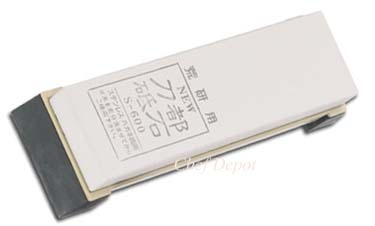 It has a 3 inch blade, weighs only 1.9 ounces and has a rockwell hardness of 59-60. Spyderco knives have a lifetime warranty. Many other Spyderco knives are available, email us for prices. When we first tested the Spyderco knives, we were amazed at the lightweight and balance of these knives. 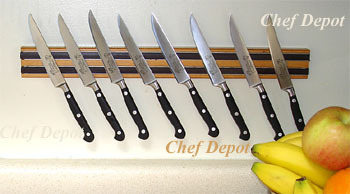 They are easy to use and hold an edge longer than all the other knives. The VG10 blades are made from layered alloy steel similar to samurai swords for unmatched strength. 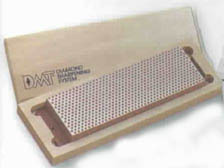 Our DMT Diamond Sharpening Steels are the best made! On Sale Now! This is the Spyderco "Native" pocket knife with a smooth blade. It has a 3 1/8 inch blade, weighs only 2.4 ounces and has a rockwell hardness of 56-57. Spyderco knives have a lifetime warranty. Features a 2% carbon CPM-440V surgical steel blade! When we first tested the Spyderco knives, we were amazed at the lightweight and balance of these knives. 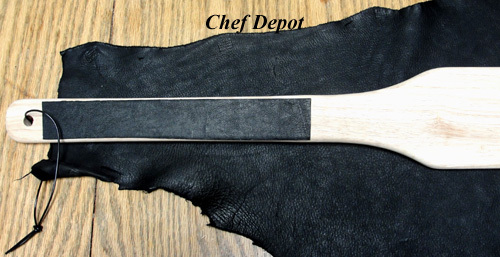 They are easy to use and hold an edge longer than all the other knives. The blades are made from layered alloy steel similar to samurai swords for unmatched strength. 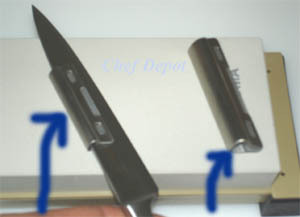 The same knife is available in the serrated blade below. 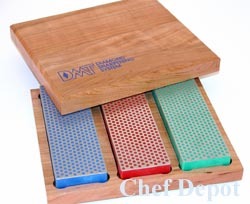 Our Butcher Blocks are the best made! On Sale Now! The Endura model is the cornerstone of the knife industry that started the trend toward lightweight folders. It is a favorite everyday carry and everyday work knife for the folks in the serving and saving professions. The 4 in. blade is made from ATS55 alloy steel, 1/8 inch thick with a 15/32 in. hole. The knife is ambidextrous and the clip is reversible. The handle is reinforced lightweight fiberglass. Weighs in at 2.9 oz. 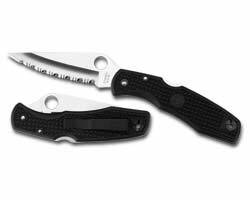 Choose from the plain edge or the spyder- edge (aggressively serrated). 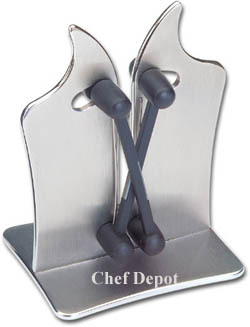 Our exclusive Red Chef's Choice Diamond Hone Knife Sharpener will look great in your colorful kitchen. This electric knife sharpener incorporates 100% diamond abrasive disks in stage 1 and 2 revolutionary flexible polymer stropping disks in stage 3 to sharpen and polish straight edge and serrated kitchen knives to hair-splitting sharpness in seconds. It is safe for all alloys and never detempers. The user friendly knife sharpening system features a powerful motor, patented 3-stage sharpening, precision angle guides and a built-in abrasive cleaning mechanism. Our Electric Knife Sharpeners save time! On Sale Now! 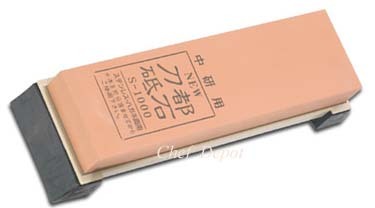 This stone features a 1000 grit fine plus base. Click here for more Whetstones! How many of you have used sharpening systems over the years that you've discarded because you can't seem to get that edge you really want, or simply can't achieve? Or is it that you can't seem to find the correct angle that your blade requires? Finally your problem has been solved with a completely new design for sharpening all sizes of knives - from pocket to fixed blade to kitchen - called Vulkanus. This revolutionary design, by Austrian Harald Stallegger, will guarantee a razor sharp edge after only a few swipes. This patented spring-loaded mechanism allows you to pull the blade through the hardened steel inserts along the blade surface, all the way to the tip. And by the way, Vulkanus tackles another problem. It is designed to sharpen serrated blades too. Imported from Austria.